The Obama administration deported 333,341 unauthorized immigrants in the 2015 fiscal year, a decline of about 81,000 (or 20%) from the prior year, according to newly released data from the Department of Homeland Security. The number of deportations fell for the second year in a row and reached its lowest level since 2007, during the George W. Bush administration. 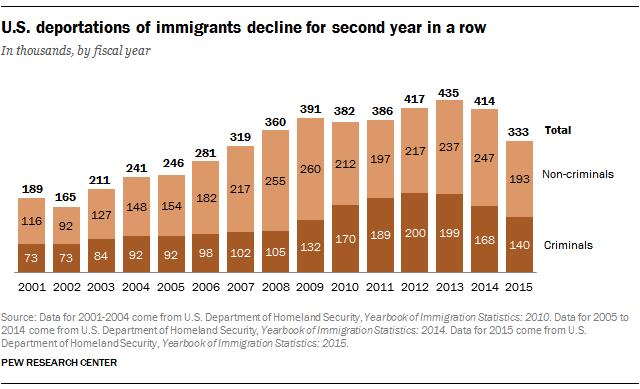 Several factors have contributed to the overall decline in deportations. The number of apprehensions at the U.S.-Mexico border, for instance, has been falling for some time: The Border Patrol made 408,870 apprehensions in fiscal 2016, a figure higher than the number of apprehensions the year before but still among the fewest since 1971. One reason for the decline in apprehensions in recent years is an overall decrease in the number of immigrants (both legal and unauthorized) coming to the U.S., especially from Mexico. (A Pew Research Center analysis shows that between 2009 and 2014 more Mexicans were returning home to Mexico than were arriving in the U.S.) Meanwhile, stricter border enforcement by the U.S. has also played a role in this trend. The Obama administration recently changed its deportation enforcement priorities, focusing exclusively on those who have been convicted of a crime; those deemed a threat to the public safety; and those who have recently crossed the border. Last year (2015) marked a major shift on this front, with those convicted of an aggravated felony making up 81% of all convicted criminals deported by U.S. Immigration and Customs Enforcement, up from 51% in fiscal 2014. This change, along with a low level of cooperation from state and local law enforcement agencies, also may have contributed to the decline in the number of criminal deportations in fiscal 2015. About 2.8 million immigrants have been deported by the Obama administration between 2009 and 2015, including a record 435,000 in 2013 alone, according to a Pew Research Center analysis of Department of Homeland Security data. By comparison, the Bush administration deported 2 million immigrants between 2001 and 2008. U.S. immigration policy was one of the most discussed issues in this year’s presidential campaign, with Donald Trump making it a key part of his campaign. After his election, President-elect Trump has said he will deport 2 to 3 million immigrants with prior criminal convictions living in the U.S.